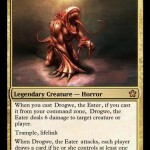 I love building decks, especially EDH decks. About a year and half ago I started building new decks pretty much every week. 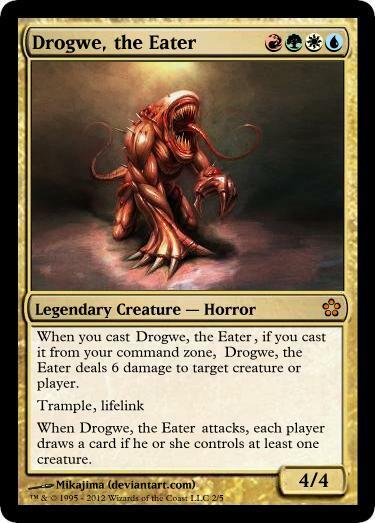 I don’t have an unlimited budget to support having dozens of EDH decks built at once, so what I decided to do was to start turning my collection into one of each EDH staple. The idea was to have a big box full of really good cards that I could pull from and be able to make a deck on the fly. 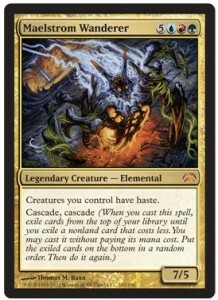 After awhile it dawned on me that what I was really doing was creating an EDH cube, about that time the MtG Commander Decks came out, so I decided to call it the Commander Cube because I adore alliteration. The best thing about cube (from the builder's perspective) is that you get to decided what's balanced and what isn't. Another thing is that its harder for players to abuse the really broken cards because you often have to build around them to make them really disgusting, which is very hard to do in a cube draft. 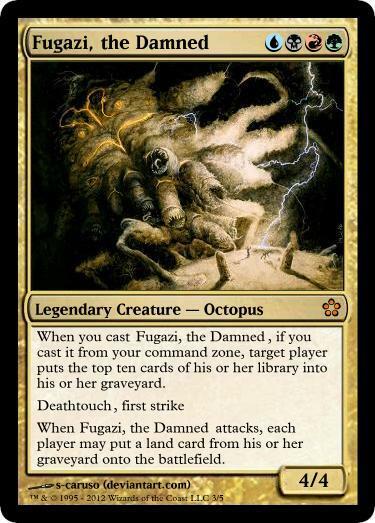 Once I decided to make the plunge and turn my collection into an Commander Cube. 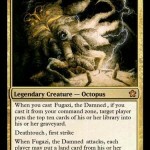 I took some time to do some research on cube design, and if anyone had done EDH cube in the past. 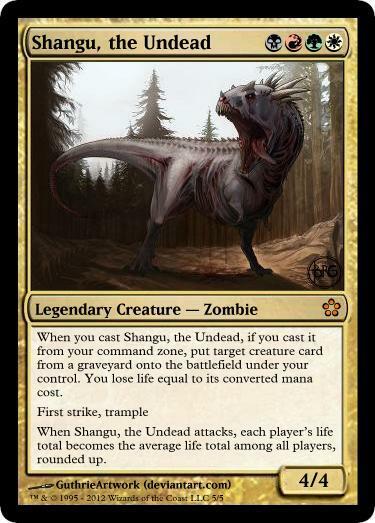 There are a number of good resources out there for standard cube design, but I was surprised to find that there really wasn’t much about drafting commander decks. The only thing I could find were some whisperings about it in the somewhat obscure “format variations” forum on dragonhighlander.net. It was somewhat helpful, but did not contain a lot of details, and didn’t look like it was exactly the way that I wanted to go with it. The first thing I wanted to determine was how many cards I was going to need to have in my cube. In order to do this I took a look at how a normal cube draft goes (or any booster draft for that matter). Most of you reading this will probably already know that you draft three 15-card booster packs and then construct a 40-card deck when you do a normal booster draft. I asked myself: if it takes 3 boosters to make a playable 40-card deck, how many would it take to build a 100-card deck? Well, 100 is 2.5x 40, so if we multiply 3 by 2.5, we get 7.5 packs. What I decided to do was to have each player draft seven 15-card packs, as well as draft some number of generals at the start of the draft. Initially each player got a pack of seven generals (commanders) and we drafted those. After a while it became clear to me that seven was a bit high, so I changed that number to four, and moved 20 multicolor legendary creatures into the packs to serve as back up plans for people during the draft. Here’s what I’ve come up with so far. 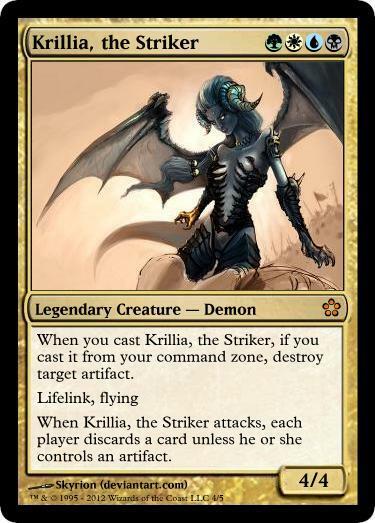 I wanted to share with everyone to inspire other people to make some awesome Commanders because there aren’t any 4-color ones right now. I’m not hellbent on winning, so feel free to build off of my ideas (just don’t copy them exactly, obviously). 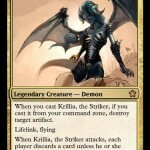 Continue reading CommanderCast 4-color commander contest. You may have heard the podcast on Commander Cast that came out this Monday, and I thought that I should give you all an update. Since they were nice enough to give us (and my cube) an awesome shout out, I figured I should give you all an update on what has changed in my cube, and what what’s been going on with it. I’ve made a decent number of changes to the contents of the cube (and haven’t really kept up the change log as I said I would). So here’s a big update. Another big change that I’ve made is that we’ve been drafting a smaller number of commanders at the start of the draft and including some in the packs. Currently we’ve been drafting a pack of 4 generals, and then 20 more are randomly selected and mixed into the packs. I’ve found that this works best because it gives the players a good direction for their draft, but also gives some second chances for those draft didn’t go as expected. A good example of how this works well came with the last time I drafted: I had been working on drafting a BUG deck and then realized quickly into pack 2 that I was squeezed out of green from both sides and then picked up a blue black general and was able to seamlessly swap into that that. In other news, I’ve created a small subset of cards that I can swap in and out of my cube to create a smaller 360-card cube for running standard cube drafts. I’ve been having a lot of fun doing Winston drafts with it. I drafted a WUBR aggro deck that worked very well, it was fun times. 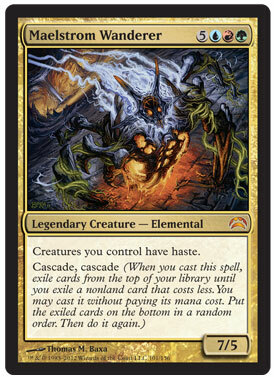 Feel free to post any questions you have about Commander cube, or regular cube in the comments and I’ll get back to you as soon as I can. Moved signets from Gold to Colorless to make room for commanders in packs. Took out 10 Gold cards for the above reason. 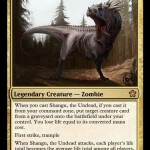 We now draft a pack of 4 commanders at the start and then proceed with seven 15-card packs. I managed to (almost) completely balance out the multicolored cards, both in the commander section and in the gold section. Trimmed down the amount of mass land destruction because it was discovered that there was a “mass land destruction deck” and I decided that was VERY BAD. Traded for over 100 foil basic lands recently!!! That was probably the funniest trade I’ve ever done. Total cards in my cube is 872 (down from 896). Look for a cube design article coming soon. Eagle-eyed adherents of Daily MTG might have spotted this gem back in November, but for the most part it’s fallen under most players’ radar. It’s the Maelstrom Wanderer, a new commander that’s going to be released this summer along with a new edition of Planechase. It reads like an EDH player’s wishlist: 7 power for that coveted 3-turn clock, haste, free spells for card advantage, and access to both green and blue – the two most powerful colors in EDH. Sure, it costs eight mana, but when you’re cascading into 7 mana spells not once but twice, that’s more of a feature than a drawback. Once I saw it, I was hooked. Availability be damned, I knew I had to make a deck. And here it is. The overall concept behind the deck is simple: ramp up to eight mana as soon as possible, then cast the Wanderer and start swinging for the fences with whatever you cascade into. It’s by far the Timmy-est deck I’ve ever put together. Sure, you could technically use Scroll Rack to sculpt the top of your deck into the perfect cascade, or run things like Jokulhaups that practically hand you the game on a silver platter when you cascade into them, but this isn’t that kind of deck. The randomness is the point. Sometimes the deck cascades into Wood Elves and Cultivate, and other times it cascades into Primeval Titan and Avenger of Zendikar. You never know what you’re going to get, but with a curve that has more 7 drops than 3 or 4 drops, the odds are it’s going to be good.